I love the French. Celebrity rock-star intellectual Bernard-Henri Lévy (BHL for short...sounds like a delivery service, like he's going somewhere, really fast!) visited Buffalo recently and had a few things to say about the Queen City. Below is an excerpt from an Atlantic Montly article which appeared last May. I've archived it, over here. That article is also the basis for his recently released book, American Vertigo where he retraces Tocqueville's steps as he races around the country with his French driver. That a city could die: for a European, that is unthinkable. And yet … Buffalo, a city that was once the glory of America, its showcase, where two presidents once lived (and where one was shot and another inaugurated), a city that on this late-July afternoon — the anniversary, by the way, of Tocqueville's visit, in 1831 — offers a landscape of desolation: long avenues without cars, stretching out to infinity; not one good restaurant to dine in; few hotels; fake gardens in place of buildings; deserted lots in place of gardens; trees that are dead or diseased; boarded-up office buildings, disintegrating or about to be torn down. Yes, a city where you can still find some of the finest specimens of urban architecture in America and some of the earliest skyscrapers, is now reduced to destroying them, because an unoccupied building is a building that is breaking apart and, one day or another, will fall on your head. The library is on the verge of financial collapse. There are streets that seem not to have any running water or mail delivery. Even the main train station, which during the era of the steelworks was a major hub, is now only a shell, an enormous abandoned sugarloaf, with rusted metal signs, wind howling, crows flying around it, and, in big letters, THE NEW YORK CENTRAL, RAILROAD, already half effaced. This review of American Vertigo by Garrison Keillor in Sunday's New York Times, archived copy - if you're not a subscriber. Let's just say it was good that I wasn't drinking milk when I read that review. Keillor is a blast...I wonder if BHL ever ended up on Elmwood Avenue or maybe in total Jayson Blair mode, looked at my blog a few times saw all the pictures of abandonment, decay and vacancy and simply passed Buffalo by. Will we ever know? Do we care? Love the French. I still do. In case you missed it, Mary Kunz Goldman's column in today's Buffalo News has a great piece about Buffalo's Richardson Complex, right here. 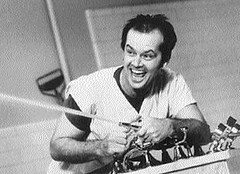 In the on-line edition, there are two hyperlinks for two of my favorite asylum sites. I think it's one of her first articles containing embedded hyperlinks. Too bad there's no mention of Buffalo's other asylum. No, not what goes on in City Hall. 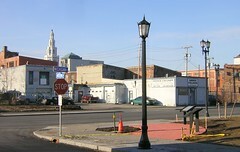 But that all but forgotten place down in Perrysburg, NY that I first reported on in January 2005. Totally insane. I've been keeping track of Artspace announcements over here in the Artspace Archive for the last 14 months. Recently I posted some breaking news about how the City is treating related planning efforts in the Artspace Impact Area and I followed it up a few weeks ago with Part - II. The companion document to Steven's poster is Chris Hawley's definative report on Midtown and the area surrounding Artspace - Midtown - Poised for Renaissance. Check it out and share it with friends considering the move from the 'burbs back to Buffalo! I'll be adding hyperlinks and pictures to this report. 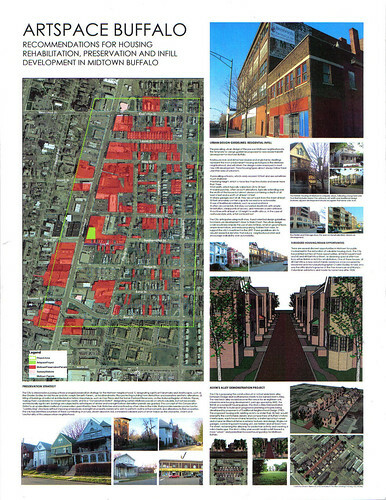 It's long, well written and provides the high level of detail that may trigger the addtional private sector investment needed in Midtown, Buffalo's newest destination on the near East Side. Let me know if you want to join in the Saturday tour. We meet across the street from Coe Place at the Sonic Cafe. Chris Hawley and Stevan Stipanovich, two of Buffalo's best and brightest urban planners have been doing a remarkable job detailing the City's newest hotspot for arts, education and residential development. Known now as Midtown, the area around Artspace, located at 1219 Main Street, stretches from Best Street to East Utica and Main to the increasingly more developed Michigan Avenue - see January, December and October. Most readers of this Masten neighborhood blog already know about my fascination with Coe Place. 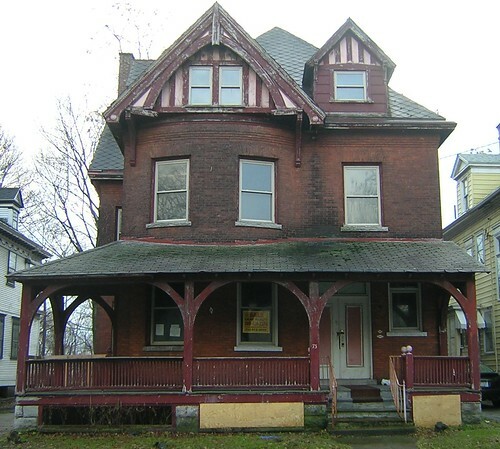 Chris Hawley has just completed the research on one of Buffalo's emerging historical land marks, the 'Hamilton Ward House' formerly known as 19 Coe Place. Here's what Chris has discovered about Coe Place's most famous resident, Hamilton Ward Jr. a Coe Place history maker. 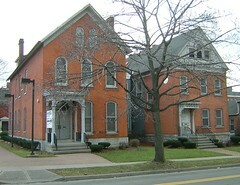 He lived a significant portion of early Buffalo life at 19 Coe Place, the Hamilton Ward House. So, who is Hamilton Ward Jr? For dearer and dearer you daily have grown. Will come to you and help you, our Hamilton Ward. I've placed the bulk of Chris's work about Coe Place in a separate report here: Coe Place. It's taken from his larger work Midtown - Poised for Renaissance, which is a definitive article about housing, planning and smart urban design for the City's near East Side. It's a comprehensive document that we'll be adding hyperlinks and pictures to in the near future. 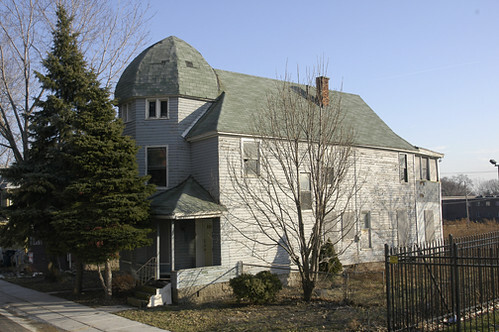 We wanted to make it available now as a major preservation struggle involving the "Hamilton Ward House" is ready to unfold. It's good to have been missed from the local blogosphere. Dozens of e-mails and a few phone calls to see what's been going on. I've been dealing with a friend's unexpectedness illness, beginning a new semester and organzing a few neighborhood walks. I hope to be back to a regular blogging schedule during the next week. There's a lot going on in Midtown regarding the pending demolition of an historic structure on Coe Place. A few "Near East Side" activists are coordinating a campaign to save this structure from the jaws of "demoltion by neglect." Some concrete news very soon. I just heard about this opportunity from Ryan Pierce over at Polis Realty. 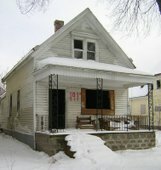 39 Coe Place will be sold at public auction. JER Revenue Services will be conducting the auction on Thursday February 23 at 11am. Here's the City of Buffalo official property description for 39 Coe Place.and the Google Map shot. Check the JER Revenue Services website for additional terms. I've known the property to be vacant for at least 10 years. It's a solid opportunity for someone who is handy and willing to make a serious contribution to this emerging arts neighborhood. Pictures tomorrow. 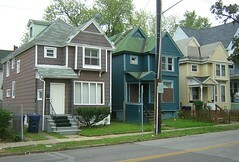 I'm getting e-mails from all over regarding Buffalo's coolest street. Let me know if you want to meet-up for a weekend neighborhood walk around. Back in October I reported on a number developments taking shape along Michigan Avenue. In December I took a few snaps of Michigan Avenue's latest retail development and last week I hinted at Buffalo's latest historic district between Broadway and William. Here a few pics that show some more of the site work and how the grounds surrounding the Jesse Nash House and Buffalo's latest historic district are shaping up. Benches, walk ways, gardens, historic markers, period street lighting and these cool new medallions are part of the sidewalk planter boxes. Loran Bommer, an excellent real estate attorney has moved his law practice into the former police station to 485 Michigan Avenue. He's way ahead of things as downtown back office support work has no where to go but east onto Michigan. I learned the other day that the fomer Spaghetti Warehouse is ready to go condo. Adding to the new mix of loft and apartment space downtown. No matter what you might think of the new Casino, the only way to get there is by driving down Michigan Avenue. Think Starbucks or Tim Hortons coming to Michigan Avenue real soon. 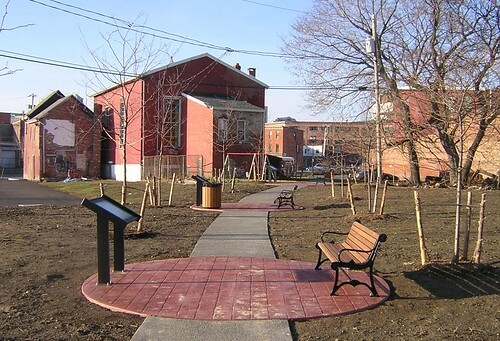 There's not much yet on the Internet about the important development involving this new historic district and its relation to the civil rights movement and Buffalo's historical development. After speaking with a representative here the other day I was told the website is still being developed. There is an important link about the Niagara Movement and information about an upcoming lecture at the Erie County Historical Society that will be of interest. In Session VI of What Price Freedom? The Centennial Celebration of the Niagara Movement in Buffalo, New York, Felix Armfield, associate professor, History and Social Studies Education, Buffalo State, and Executive Director of the Nash House and Museum, will discuss Reverend J.E. Nash's prominence during the first half of the twentieth century. Jesse Nash, professor emeritus, Canisius College, will share his experiences growing up in the Nash home. While checking out the site I quickly noticed that Dr. Felix Armfield from the Buffalo State College History Dept. has been pivotal in getting this historic district together and also Professor Kim Pearson from the College of New Jersey. The only Niagara Movemnet Board member with a blog. Check out her blog, right here. Further up Michigan near Dodge Street, and right behind the developing Mid-Town and Artspace neighborhoods, local developer Rocco Termini is building a couple dozen single family "in-fill" homes. Here's some early Termini that is still standing over on Emslie and of course we all know about the Ellicott Lofts, the more mature Termini. The problem with these in-fill homes, though the new ones Rocco is now building have a better urban look and feel to them, is that they are heavily subsidized and have a much too frequent tendency to lose more than half their value when the second owner buys them from a bank after a forclosure. They have been selling 10 years ago for for 85-90K and just recently re-selling in the 20-25K range. I've been interested in connecting both parts of Buffalo since I started blogging in 2004. I wrote about the transformational quality of the decision to re-locate Performing Arts High School along East Ferry Street. Here, I imagine arts and education to be the link between an emerging arts and educational community on the City's near East Side and the more popular and frequented West Side commercial neighborhoods along Elmwood Avenue. 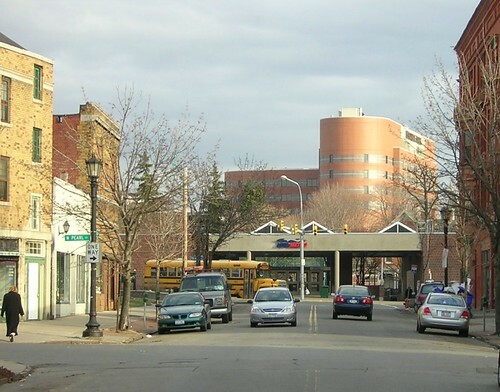 I've heard that there's a plan ready to go that will extend Allen Street across Main Street and place the east end of Allen somewhere crossing Washington and bisecting Ellicott street. So, earlier in the week I went to take a closer look at the Metro stop that would be radically transformed by the new street design. Here's a snap looking east on Allen towards the subway stop. 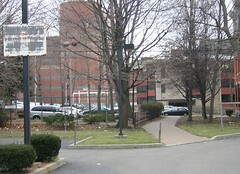 The Roswell Park campus is in the background. And two close up views. 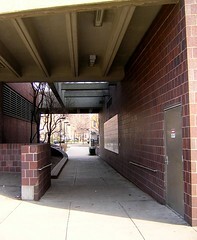 This was the first time I've had the opportunity to walk through this pedestrian tunnel. This public poetry pannel is easy to miss if you are driving, which I find myself doing less of every month. 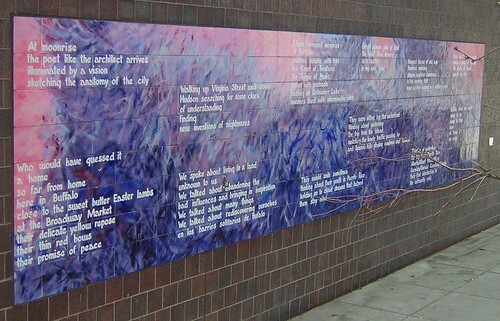 Click on the series to see this public poetry. And if anyone knows who's responsible for this creation, kindly let me know. When you look east through the pedestrian tunnel - which sort of lines up with Allen Street- (google map), you'll see some really cool houses that have been converted to medical offices on Washington Street. Very slightly to the left there's a parking lot and looking a bit further there's a path that winds between another parking lot and a house that's even more impressive than these two brick houses on Ellicott. 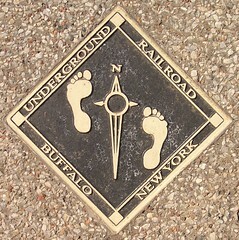 Making the connection toboth halves of Buffalo, East and West, is important. Yet the proposals flying around have included taking down these houses to make room for a "straight" road. Please, this is Allen town. If the street isn't straight and curves somewhat, does it really matter? 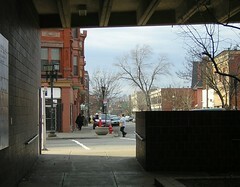 If a right of way can't be negotiated with the property owner at 937 Washington, perhaps a more pedestrian and urban friendly subway stop, as in an underground one with retail redesigned on the street level is approriate for this connection to the City's East side. Maybe a well designed and smaller street connecting to Washington and a pedestrian zone to Ellicott is inorder here. With the Preservation Coalition recently taking up residence in the Red Jacket Building on the corner of Main and Allen look for more creative designs and urban friendly planning in this East and West Side connector. 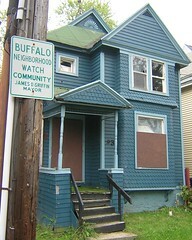 It's hard to imagine a demolition of 19th century Buffalo residential property right on their door step. I re-visited a city of Buffalo owned property at 319 Koons Avenue just a short ways away from the recently renovated Harvey Austin School located at 1405 Sycamore. Here's the google map showing the proximity of 319 Koons to the Harvey Austin School, one of Buffalo newest public schools. 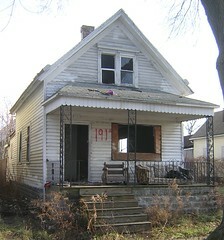 It sits directly across the street from 320 Koons Avenue, the scene of a four brutal murders in April. It's still wide open in the back, 100 days after informing John Hannon, Director of Real Estate that the property needed his immediate attention. So, will someone please tell me what's happening here on Koons Avenue? 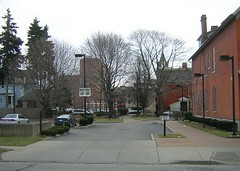 A new City school and at least two examples of abandoned, boarded, derelict and vacant City owned property in the immediate proximity of a center for education and learning. Think about it. 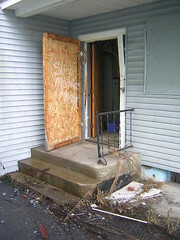 If these properties were on Elmwood or in North Buffalo...would it take a year or longer for these properties to be properly boarded and secured? What's it going to take. Four more murders...a child being abducted before the condition of City owned property becomes a priority. Meanwhile just a block away at 191 Goodyear Avenue, nothing has changed. Picture on the left is from January 2005 and on the right yesterday. 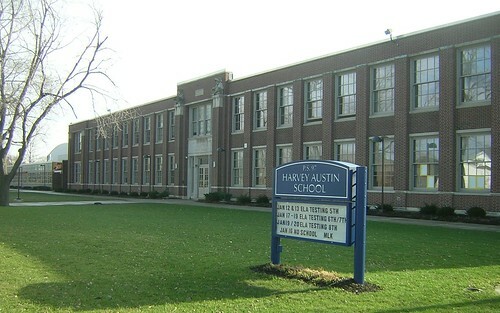 See the relationship between 191 Goodyear and the Harvey Austin School, right here. Check out the School House Project. Just over the tracks and 500 feet away is the Wollenberg Grain Elevator. It's the fourth stop on a Preservation Coalition sponsored Bicycle Tour - dubbed by some as the Tour de Neglect - that I'll be leading this summer. As you can see, the place is a total mess and under the City of Buffalo's ownership the place has continued to deteriorate. Last year there was only one opening that my urbex partner and I could access, yesterday there were two additional openings, one that you or any school kid mesmerized by this structure could simply walk into. Remember? This was last year...same place! Read all about David Franczyk's dereliction of duty over here...Perrysburg Follies! Oh yeah...almost forgot. 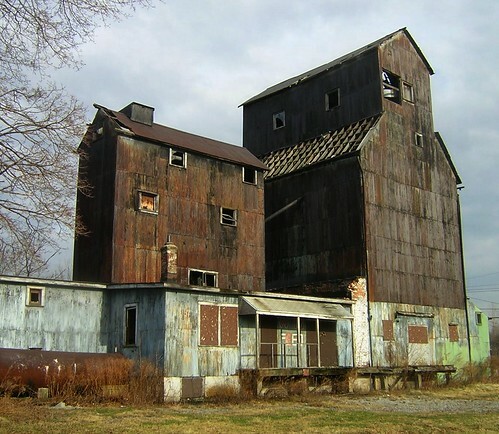 The Wollenberg Grain Elevator is on the National Register of Historic Places. I've had the opportunity to tour the neighborhood surrounding the Artspace area on the City's near East-Side three times this week with potential investors and local artists looking for additional studio and living space. Every one has fallen in love with Coe Place and the brick oven pizza over at Delta Sonic, right across the street. A few buildings that appeared on the City's poster have really captured the attention of investors and local artists. 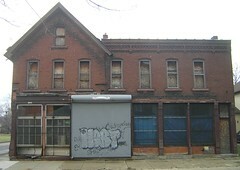 The former Joseph Denzel's Tavern at the corner of Riley and 1325 Michigan, would be a revitalized as a mixed-use project under the City's revitalization program. Google Map - location and City Property Description. This building has been vacant for at least the past 11 years. 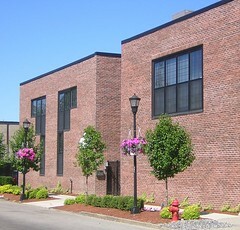 The brick former livery stable at 65 Riley is a small building with vast potential as a placeholder for the corner of Holland and Riley. 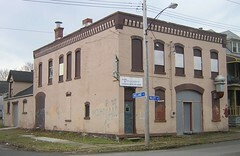 The City hopes to find an active reuse for the unique property, perhaps as a conversion to retail or gallery space. Google Map - location and City Property Description. 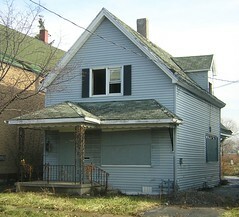 Additional opportunities include this HUD owned single family home at 73 Northampton. Here's the City's Property Description for 73 Northampton. There's a Cash Cunningham sign in the front window or you can see the property by contacting Polis Realty. Check out this City owned single family home at 93 Riley when you are in the neighborhood, too. Don't forget the Coe Place Slide Show and check out what Buffalo Rising has to say about Artspace, too. Great comments.